By now I hope you've managed to have a listen to my new podcast, On The Ledge: it's not meant as a replacement for this blog, but a complement to it. The third episode, on office plants, should be up in the next couple of days, but in the meantime, I wanted to share with you an insight into one of my favourite sources for plants - IKEA. When I was a kid, Woolworths was my go-to place to buy houseplants: since that store's demise, IKEA has taken its place as a shop where I always end up leaving with at least one plant. As many garden centres stopped selling houseplants in the early '00s, IKEA became a trendsetter for indoor gardening - selling the classics, but also introducing us to new plants that will grow well in our modern homes. I wanted to find out a bit more about how IKEA's plant sales work, and I managed to get Anna Liakh, Sales Responsible for Plants at IKEA Global, to help me out. Below you can read my questions and Anna's answers - then scroll to the bottom for my pick of some of the best houseplants available from IKEA UK. Me: Average individual spending on houseplants in the UK has always been less than other European countries, especially Scandinavia ... what can the rest of the world learn from the Swedish approach to indoor plants? Anna: Bringing ‘green’ to your home and making plants part of the interior is a big trend today. The sales of indoor plants in the UK is proving this; year after year we are attracting more customers with our plants offer. However, considering the cultural differences and the living conditions, it might be that people in UK, where many have houses and gardens, as well as the weather is milder, will have as many plants at home as in other markets where more people live in apartments and it is either very hot or very cold to grow outside, and that’s why they may have more inside! Me: Houseplants, and especially succulents and cacti, are becoming very trendy. How do you at IKEA spot the next plant trend? Anna: During the range selection process we visit various design fairs and plants exhibitions, mostly in the Netherlands, and we also get inspiration from home furnishing magazines, blogs, furniture fairs, etc. Some of the ideas we get are from our customers, for this we constantly collect feedback from the markets. It is a challenge to spot the trends! Me: Inevitably, I also want to ask - what *is* the next big trend in indoor plants? Anna: At the moment cactuses and succulents are very trendy, as well as the other ‘easy to take care’ of plants. I believe the trend will continue and the plants that require less time to look after will be popular well into 2018. Also plants that are supporting the wellbeing trend, e.g. air cleaning. We can see that the hanging plants are trendy again, vertical gardening and big hardy green plants (e.g. Ficus elastica). Me: Whenever I go to IKEA I always seem to come out with a plant ... do you deliberately position plants just before the tills to maximise impulse sales? Anna: Plants are attractive to many customers and we want to place them in an area that many customers will pass by. We’re also aware that it can be a hassle to carry the plants through the whole store whilst browsing for other products, which is why it is good to place them just before the tills. Me: How and where do you source Ikea's plants from? Anna: Our aim is to source as locally as possible to secure that the plants are affordable on each of our markets, keep transportation distance short, and make sure we don’t scrap a lot during the transportation. For example, plants in Europe are sourced from the Netherlands where we have several big growers who have been working with IKEA for many years. Me: How do IKEA's sales of artificial plants compare with live houseplants? Is that balance changing over time? Anna: Artificial plants share is increasing year after year. We see that even in the markets where people have historically been more resistant towards artificial plants, they are more open to buying them today. It is probably connected to the sustainability factor, as well as the improvements that have been made to the quality. We believe the trend will continue and more customers will buy artificial plants to decorate their homes, as well as many of the business customers. At £19, the areca palm (Chrysalidocarpus lutescens) isn't the cheapest option but you get a plant that's 1.2 metres tall - big enough to make a statement in a room. 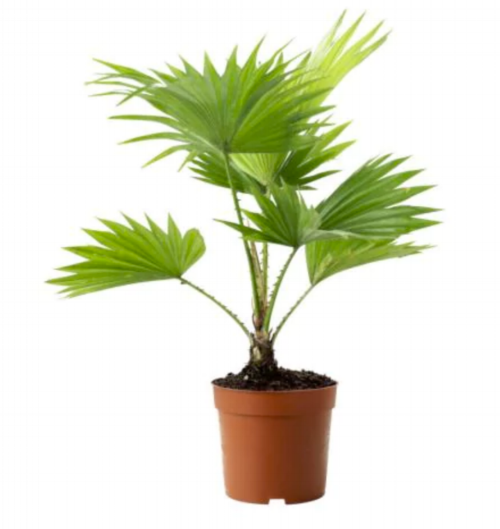 Not only is the areca palm tolerant of the conditions found in most modern houses, it's also listed by Nasa as a good plant for removing pollutants formaldehyde, xylene and toluene from the air, and it's nontoxic to cats and dogs, too. It needs bright light but not direct sunlight. Your main worry is making sure conditions are humid enough - try grouping it with other plants or placing the pot on a tray of gravel or pebbles and water. OK, so I have written about how I love this plant before, but it really is worth repeating - the ZZ plant or aroid palm (Zamioculcas zamiifolia) is £9 well spent, if you ask me. It will handle whatever conditions you throw at it without wilting, sulking or otherwise harassing your mellow. It doesn't mind being potbound but is so vigorous it will eventually bust out of its pot if given half the chance - yes this is the incredible hulk of houseplants. And it has a cool name! You may not find it in your houseplant books - DR DG Hessayon lists it as a "rarity" in his Houseplant Expert - but it's definitely worth a try. For £3.75 you're getting a 30cm tall potted plant with attractive glossy leaves You're unlikely to get the pinky white flowers in your average living room plant, but who cares, this is just a great foliage plant. These aren't the easiest houseplants to keep alive but boy, are they cool. As Dr DG Hessayon once wrote (and yes, I will be quoting him endlessly ...) these plants have "the distinct air of luxury". The actual flower is the rather phallic-looking yellow spike; the bright red shiny shield around it is actually the spathe. Anthuriums like things warm and humid, just like their jungle homes in South America. If you have a warm, bright bathroom or kitchen, this might be the plant for you. 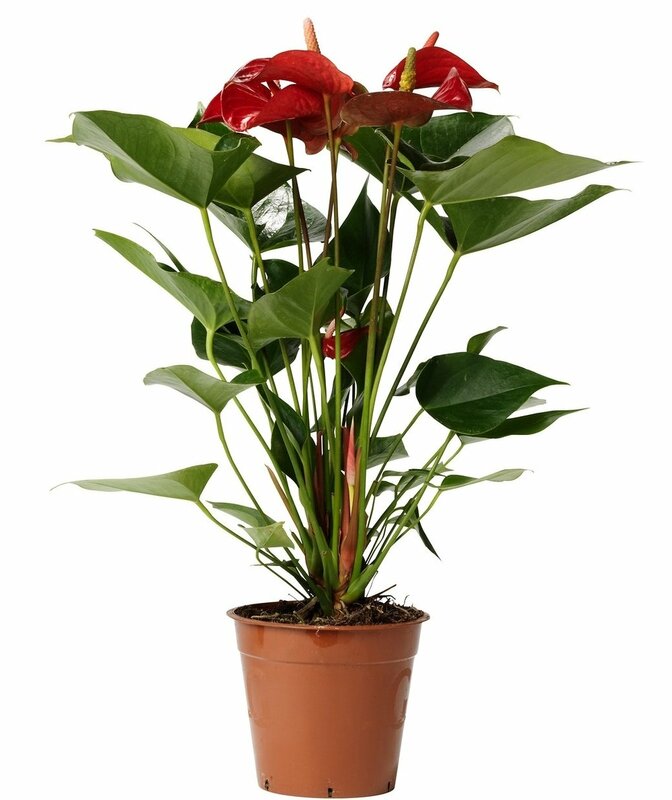 IKEA's anthurium (they call it a flamingo plant which is a bit, well, cheesy) is £7.50 for a 55cm tall plant. Now, I have to admit I don't know much about this one, but I know I like it... Livistona rotundifolia is a palm from southern and southeastern Asia that also serves as the national leaf of the Philippines, where it's known as anahaw. By all accounts it does well in the relatively low light conditions of the home, although it will need a reasonable amount of humidity so try it in the bathroom or kitchen. IKEA's footstool palms are £5.50 for a 35cm tall plant. On The Ledge is free to listen to but not free to make, so if you've enjoyed On The Ledge there are various ways you can make sure there are more episodes in future! Leaving the show a review on iTunes is a huge help - you can do this here. If you fancy supporting the show in another way, you can buy me a coffee - yes really! Click on the link below and you can simply and safely donate the cost of a cup of the strong stuff to keep On The Ledge going strong. And finally - March is #trypod month, a campaign to get people who aren't yet listening to podcasts tuned into the possibilities of this wonderful format. So, if you like On The Ledge, why not tell your friends about the show?